Best library to read a book in Sydney? We all love a good book. We also love a good library in which to enjoy books. Libraries can be sanctuaries for bookworms and non-bookworms alike, and they can make a big difference to our reading experiences. Which library in Sydney offers the best books, service and architecture? 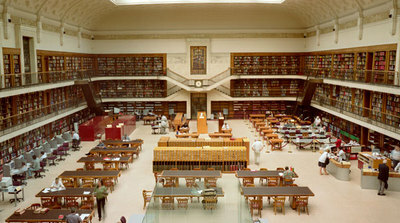 The NSW State Library is lovely. It's really nice to read and research while being surrounded by walls and walls of books. Also, Kogarah Library is great for a quiet read, it's got a calm atmosphere, comfy chairs and individual study rooms available. I agree, the State Library is beautiful I also like the library inside Customs House. Peace and quiet all round with lovely chairs, or a sofa if you wish. I enjoy Chatswood Library for a reading session. It's big, and there are chairs (and tables) everywhere, so you're pretty much guaranteed a seat. Best scrambled eggs on toast in Sydney? Best family picnic area in Sydney?